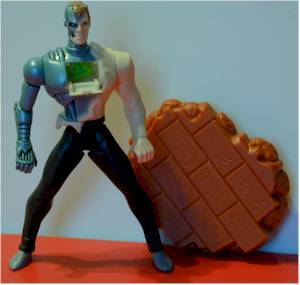 Many collectors of the Animated Superman series - called STAS (Superman The Animated Series) - were very disappointed when the Metallo and Bizarro characters were only released in Europe. There was a small release to U.S. comic shops through Diamond Distributors, but you had to buy an entire case of figures, heavily packed with Superman variations, just to get two of each. The single carded Metallo and Bizarro therefore became quite expensive on the secondary market, but this time Kenner came to the rescue. They have re-released the Metallo and Bizarro as part of this four pack, exclusive to Toys R Us. At $20 for the set, some collectors may be annoyed at having to buy a Superman (Capture Net) and Supergirl they most likely already have, but it's a darn good price considering the secondary market going rate on the two other figures. A nice looking box, with plenty of appropriate artwork. 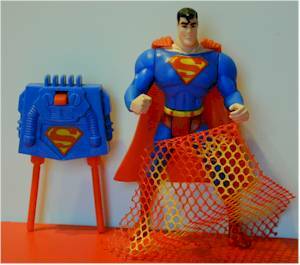 Twist ties are non-existent, and all but the Superman firing backpack can be removed from the bubble without any cutting. Each figure comes with their standard accessories. 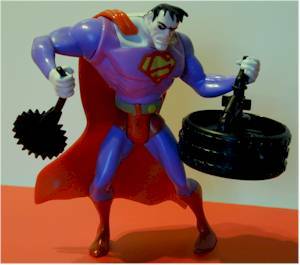 The spinning arm action on Bizarro is especially cool, but the others accessories are pretty standard. Great work on the paint jobs - particularly Bizarro and Supergirl. 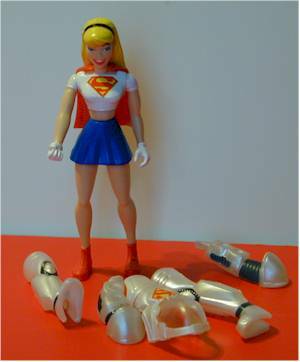 They've improved on Supergirl from the initial, single-carded release. Her facial details are much better, and her t-shirt is a true white, rather than the original off white. Nice sculpts, particularly Bizarro, once again. The only downside, and I include this in sculpting, is that the pose that Bizarro is forced into due to the way his legs and upper body are contorted, is a tough one to keep him standing in. As a big fan of the animated Superman show, I had to get this set just so I could have the Metallo and Bizarro. I'm sure plenty of other collectors will feel the same way, and they won't be disappointed with Bizarro. It's too bad we had to end up buying four figures to get the two we wanted, and that's why this set doesn't get better than a **1/2.